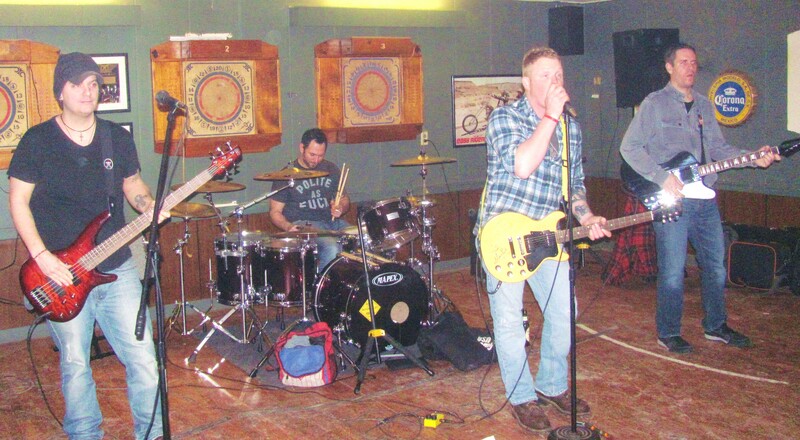 Members of Stealing Neil, including (front, from left) rhythm guitarist Ronnie Williams, lead singer and guitarist RJ Scouten, lead guitarist Jared Scavone, and (back) drummer Tony Scavone satisfied the rock ‘n’ roll urges of a large crowd at the Lovelton Hotel on Saturday night. Having missed Stealing Neil’s performances on two prior occasions due to snow storms, it was great to catch up with the four-piece all-guy ensemble at the Lovelton Hotel Bar & Grill on Jan. 18. I tend to shy away from self-proclaimed hard rock bands because too many of them are more about volume than substance. I love music; I don’t like noise. No doubt about it, Stealing Neil played loudly, but they also played well, exploring a repertoire that rests comfortably in a place where alternative music meets hard rock without becoming it and vice versa. 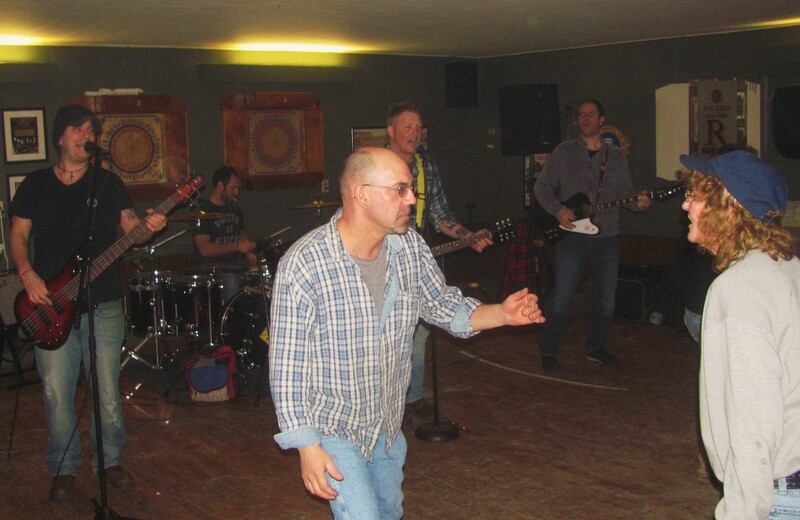 Three guitarists and a drummer drew dozens to the dance floor with a rocking beat that seldom stopped. Tunes by Jet, Stone Temple Pilots, Guns & Roses, AC/DC, Neil Young, Pearl Jam, and Journey not only kept those on the dance floor happy but those in the bar area as well, who were singing along throughout the band’s three sets. Stealing Neil played nearly every dance-able Led Zepplin song that was ever recorded. It brought back great memories of my sister and my mother and I dancing to Led Zepplin in our living room before Mom would go out at night when we were kids. The song list reached back to the 1960s while also including some current hits. A surprise offering of the evening was a straight ahead rendition of Bruno Mars’ “Locked Out of Heaven,” confirming that many songs that we consider to be pop or dance hits are still just rock ‘n’ roll. The band members proved to be very social in between sets. In addition to chatting with some closer friends and regular fans who had followed them to Lovelton, the band worked the rest of the crowd, stopping to discuss whatever the patrons had on their minds. Lead singer and guitarist RJ Scouten parked himself on a stool at our table and shared with us his plans to move his family to a piece of property in Noxen Township. He is a firm believer that tougher times lay ahead, and, like many of us in the countryside, he wants to master the skills needed to truly live off the land. He’s already and avid hunter. According to lead guitarist Jared Scavone, he and Scouten have been playing together as Stealing Neil for about 11 years, having bounced off each other in other bands prior to that. The two oldest members and rhythm guitarist Ronnie Williams live along the Luzerne/Wyoming County line, while drummer Tony Scavone lives in Philly. Their candor, their earthiness, and the musicianship that they have honed as longtime friends and grounded dudes is what makes their performance so legitimate. I have never liked Journey’s “Separate Ways,” for example, but I thoroughly enjoyed hearing Stealing Neil play it. An earnest cover version at its most basic level, the song snapped with the crispness that marked the rest of their playlist. The dance floor was packed most of the night. I literally had to sneak up on the band as they struck the first chord in their second set just to get a photo of them. Within seconds, (below) the same shot was impossible. 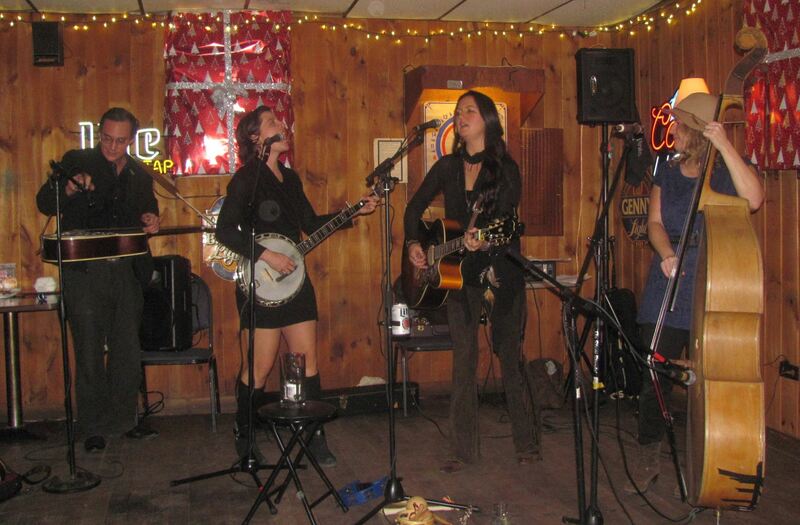 The Lovelton attracts a fun crowd of easygoing rednecks who like to get their shine on and have a good time instead of wining in their whiskey or looking for trouble. The bar is rustic but clean, and what the back room lacks in character, it returns in easy access and spaciousness. Two bartenders on duty ensured that no-one waited for a drink – even though a few people should have. Follow Stealing Neil and Loveltons Lovelton on Facebook.